Cover image: Stretchable and twistable electronics. Credit: John Rogers, University of Illinois. The National Science Foundation is the only federal agency dedicated to the support of basic research and education across all fields of science and engineering. For 60 years, we have been exploring the frontiers of scientific knowledge and extending the reach of engineering by encouraging, identifying, and funding the best ideas and most promising people. The high-risk, potentially transformative investments we make generate important discoveries and new technology, create and train a dynamic workforce, and spark the curiosity and creativity of millions. Our investments in research and education help ensure that our Nation remains globally competitive, prosperous, and secure. 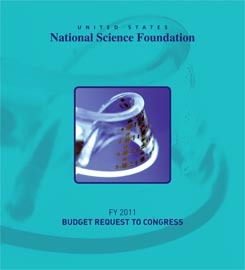 NSF's FY 2011 Budget Request is $7.424 billion, an increase of $551.89 million (8 percent) over the 2010 enacted level. NSF-funded research is characterized by its breadth. NSF prioritizes the integration of education into its research programs, and takes into account the broader societal impacts of the work it funds, such as the training that students and young researchers receive in the research process, and the educational opportunities the work and its people can then provide to the larger community of K-16 students and teachers and the general public. NSF's comprehensive and flexible support of meritorious projects with broad societal impacts enables the Foundation to identify and foster both fundamental and transformative discoveries within and among fields of inquiry. NSF has the latitude to support emerging fields, high-risk ideas, interdisciplinary collaborations, and research that pushes, and even transforms, the very frontiers of knowledge. In these ways, NSF's discoveries inspire the American public--and the world. For more information about file formats used on the NSF site, please see https://www.nsf.gov/help/plugins.jsp.